Is Using My Tax Refund for Automotive Services a Smart Idea? The deadline to file your tax return is coming up, which means many taxpayers will be getting a tax return check soon. But do you know how you are going to spend your tax refund? For some car enthusiasts, spending your refund on upgrades to your vehicle is a must. However, there are many car-related items that must take priority over upgrades. Luckily, our automotive service technicians have some ideas that could help you figure out the best way to spend your tax refund. Are your brakes squeaking? Are your tires bald? Is your engine firing irregularly? These may be signs that you need to invest your tax refund toward getting your vehicle repaired. Not only will repairing your vehicle keep you on time to work and other appointments, it will also keep you safer. Worn out tires can suffer blowouts and cause crashs. A sudden engine failure can cause you to lose control of your vehicle. Take preventative steps and get your car’s maintenance level up to snuff, invest in repair and automotive services for your vehicle. If your vehicle is all caught up on maintenance and repairs, that’s wonderful. However, cars come into our German auto repair shop year-round. This fact means that you need to be prepared for that unexpected repair. So, before you spend your tax return on a new doodad or going on a fun trip, perhaps you should make sure you have a good rainy-day fund set up. Having savings ready in case you have a car repair emergency will keep you from borrowing money and winding up in debt. Your tax refund can be a great start to an emergency savings account. Financial advisors often recommend having at least $400 in your rainy-day fund, but some car repairs can exceed that, so $1000 might be a better goal. Should I Buy a New Car With My Tax Return Check? Another common thing people do with their tax return check is buy a new or used car. This can be a bad move, and here’s why. A tax return check isn’t usually large enough to pay for a car outright. That means you will have to finance the vehicle, which means you will be adding debt to your credit. Instead of paying all that money, consider investing in the car you have. There are many upgrades for vehicles that can add more power, efficiency and luxury to your current ride. Even taking your vehicle in for a tune-up can do wonders for your driving experience. Best of all, many of these upgrades will cost less than a new care while still providing you with an improved driving experience. However, California has many regulations when it comes to vehicles, make sure you hire a shop that understands the rules. 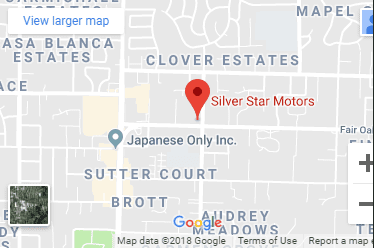 Here at Silver Star Motors, we are all about improving your driving experience and quality customer car. We provide Mercedes maintenance and repair services to help your vehicle run at its peak. We have over 25 years of experience providing automotive services for all types of German cars, including BMWs. Give our shop a call at (916) 318-9445 to schedule an appointment, or fill out our online contact form for a quote.